The Simret.ic is the latest in-cab brake tester from Turnkey, designed to let drivers of vehicles and mine locomotives test brake performance during their working shift. Simple to operate - just push a button while stationary and wait for a blue light to confirm the instrument is ready. The driver then accelerates to the recommended test speed and applies the brakes to stop, A green light indicates a pass, and a red light a fail. 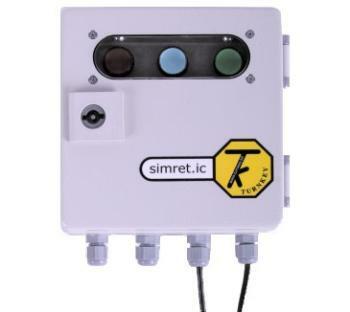 Simret.ic is housed in a lockable plated steel case (hose-proof to IP66) which restricts access to the engineers control panel. This allows the vehicle mechanic to change settings and print or download up to 99 stored tests.